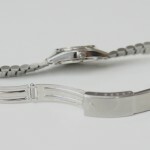 If your metal watch band is too big, you can easily remove links to make it smaller and ensure a perfect fit. Use this guide to remove links that are held in place with pin and sleeves. 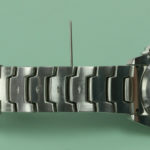 How do you know if your watch band uses pin and sleeve pins to keep the links together? Look at the pins and if there is no specific marking to show which way the pin should be removed and you can see a small metal ring around each end of the pin within the link you probably have a pin and sleeve style link. You may need an eye loupe to see the ring around the pin. Once you know how many links you need to remove from the band, you need to decide how many links you are removing from each side of the watch band. Anytime you are removing more than one link, you should split the total to be removed between both sides of the clasp so the clasp will stay centered on your wrist. Choose the side you want to start with and set band in the watch band holder to keep it steady. Make sure that the hole of the link you want to remove is positioned over a hole in the band holder. Feel free to open the watch band if you need more space to work. NOTE: You will need to use some force to remove this pin, so start gently and work slowly up until the pin starts to move – over doing the force could damage the watch band. Take your pin pushers and find the pusher that will fit on the head of the link pin without touching the sleeve ring around the outside of the link. Center the point of the pin pusher over the link pin in the watch band. Holding the pusher steady, take your small ball peen hammer and begin to tap on the end of the pin pusher with the flat head side. When you cannot push the pin pusher any further into the band, set the pusher aside and remove the watch band from the holder. At this point, you will need to take the jeweler’s pliers and remove the pin. Hold the band firmly in your hand and grip the partially removed pin with your jeweler’s pliers to pull the pin out. Put the pin aside in your parts tray. The band should open into two pieces. Set the watch band back in the holder so that the end with the two sleeves still inside the link is accessible. Using the pin pusher again, position the tip inside the link hole against the silver ring of the pin sleeve. Pound the friction sleeve out of the hole with your ball peen hammer. Again, be careful not to use too much force and damage the watch band. When the first sleeve falls free you can set it aside and turn the watch band over to remove the second sleeve from the link. Again, line up the pin pusher with the thin edge of the sleeve and begin tapping on the pusher with the flat head of your ball peen hammer. Continue applying pressure to the sleeve until it falls out of the link. Set it aside. Count the number of links you need to remove from this side of the watch band. Place the watch band in the watch holder and align the hole in the last link you need to remove with a hole in the holder. NOTE: You shouldn’t have to remove the sleeves from this link because they will be in one of the links that you are removing. Put the extra links in your parts tray with the pins. Take your pin pusher again and pound out the pin in this link with the flat head of your hammer. When you can’t drive the pin pusher down any further, set it aside and remove the band from the holder. Remove the pin from the band with your jeweler’s pliers and set it aside in your parts tray. Take one of the pins that you removed from the watch band and measure its width with your digital gauge. Once you have the width of the pin, you can find the correct size replacement sleeves for the band. With the replacement sleeves ready, line up the two loose link ends together. 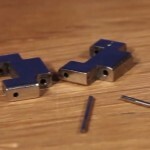 Then, take one of the pins from your parts tray and slide it into the hole in the link. Hold the pin in place in the links while you put the watch band in the band holder. 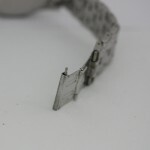 This time, be sure to line up the hole in the link with a solid section of the watch holder to keep the pin in place. Then grab one of the new sleeves with your non-magnetic tweezers and place it over the hole in the link with the loose pin. Next, take your ball peen hammer and with the flat head end, start gently tapping on the sleeve until it is pushed enough into the link that it won’t roll away. Once it is held steady, you can use more pressure to tap the sleeve into place. As the sleeve slips further into the link and your hammer gets closer to the watch band, take your pin pusher again to add some distance between your hammer and the watch band. Make sure you move the pin pusher around so the sleeve continues to go evenly into the link. When the first sleeve is in place and flush against the band, remove the band from the holder and turn it over before replacing it in the holder. Place the second sleeve on this end of the link and pound it into place like you did with the first one. Remember to use the pin pusher to add distance between the hammer and the watch band as the sleeve is pushed into place. With the band back together and before you remove any more links on the other side of the band, put your watch back on and check to see how it fits. Feel free to do the link test again and see if you still need to remove the number of links you decided on previously. Once you have verified the number of links you need to remove, take the watch off again and turn it so you can remove the next links from the other side of the band. Repeat steps 3 through 10 to remove the remaining links and put the band back together again. Now that your watch band fits just the way you want, you can wear it again. Be sure to keep the extra links and pins that you removed from the watch in case you need them again in the future. If you need to add links back to your watch band, you can check out our learning center article on How to Add Pin and Double Sleeve Style Band Links to your watch band. I love watching watch repairing and do the same for the last few years. I have acquired several tools too. However, I desire to buy some more tools and for that I need names of tools with part numbers and cost which I am unable to access on you tube with live demonstrations. Will appreciate IF entire list of small tools is made available as desired. The “Tools Needed” section of this article contains links to the website where you can purchase these items. It is up to you to decide which tools will meet your needs.